This is our retirement dream condo. We live only 4 miles away and when the kids are grown and we sellt he "big house" this is where we are going to live. 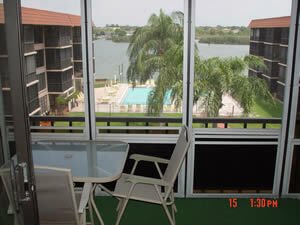 Fourth floor, facing the Gulf on the front side and the inland waterway/pool on the patio side. * Rec room with activities. * Heated pool and Hot-tub. * Separate Men s & Woman s Sauna. * Community boat docks and fishing pier. 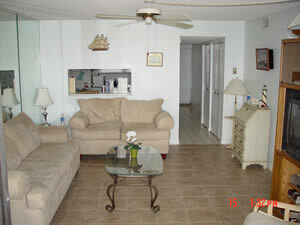 * Beach access located just across the street. 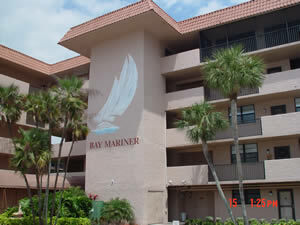 This complex is centrally located between Clearwater Beach and St. Pete Beach; just west of Tampa Bay and St. Petersburg to allow you plenty of vacation fun. Other Information about the sleeping facilities: You could fit a child on the sofa and a baby in a crib/basinet easily if you are a close family of 6! 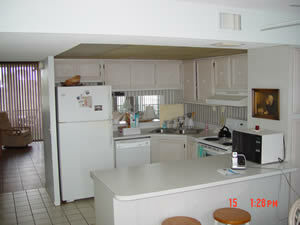 Other Information about the kitchen/dining facilities: The kitchen and dining room are separated by a kitchen counter. Other amenities not listed above: 100 steps to the Gulf of Mexico and miles of beaches, and right on the Inland Waterway with docking privileges if you have a boat. Incredible views. Try a July 4 vacation--the fireworks go on all evening! Other information about pets: Small dogs preferred. MUST be housebroken and quiet. Other activities/entertainment: Just about any beach actity you could think of is available within 5-10 minutes. Other Information about the property: We have recently upgraded two rooms to tile and put in a new Queen size bed/mattress in the master bedroom, and other furniture is mostly less than 2 years old. 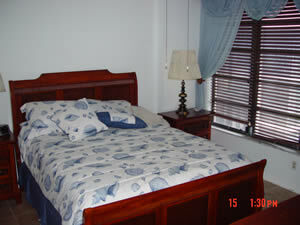 Rental rates: October-April $2240/mo., plus electric if over first $100.